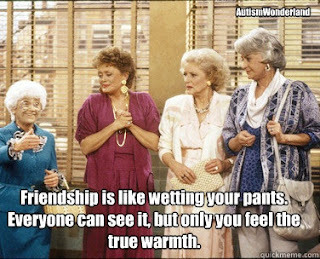 Today is National Girlfriend Day - a day for celebrating friends, sisters and friends who have become our sisters. I've realized the older we get, the harder it is to maintain a friendship. We grow up. We grow apart. And sometimes we break up. Before I was a mom, there were after work dinners and drinks with girl friends. There were afternoons of shopping and getting our hair done. Friday and Saturday nights, dancing all night. On Sundays, there was brunch. Now that I'm a mother, those days and nights are few and far between. And being a special needs mom, friendships become even harder to maintain. After The Boy was diagnosed, I felt isolated. There was no one in my circle of friends who could relate to what I was going through. I am fortunate that most of my friends have been understanding. I've heard moms say that their friendships have changed after a diagnosis. One thing I've learned while on this journey is - we cannot do this alone. We need a support system. We need our friends. 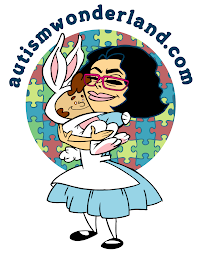 So how do you stay friends with an autism mom? 1. Be Aware. Autism Awareness is a two way street. Become familiar with the diagnosis (at least the basics) and common terminology. Your friend will need you more than ever and if you have an understanding of the disability - that will make her feel less alone. She will realize you're in it for the long haul too. I love it when my friends read or see something about autism and they share it with me. It tells me that they want to learn. And if you have kids, take the time to explain autism to them. Chances are your friends kid may not have any friends or siblings to play with. It would be be great if you could schedule a play date. Especially if your child is a year or two older - the older child can act as a role model for the younger one. 2. Understand HER. Those first few months after a diagnosis, she may be distant or distracted. There may be times when she's just not available. And she may not pick up the phone when you call. It's not that she doesn't want to be bothered with you - she may just be going through a really tough time. She may be overwhelmed. And she may not want to talk about it. Understand that she may be flaky and that it's hard for her to make plans. Childcare will always be an issue. Understand that if she cancels plans at the last minute, it's not that she doesn't want to spend time with you, it's just a bad time for her or her child. Do not stop extending invitations - one day she will say yes and you will both have a blast. However, on the day you really need your friend - she will find a way to be there for you. 3. Listen to Her. When you finally get your friend on the phone or out of the house. She may need to vent. She may need to cry. Let her. You don't have to really say anything. It's okay if you don't offer advice (especially if you don't have a kid with an autism diagnosis). Just let her talk and get it all out. But, don't let autism rule the conversation. Try to talk about things that will make her laugh. She'll want to know about you too, she may be too preoccupied to ask. 4. Understand Her Kid. Understand that her kid may not be able to sit in your house for long and they may have to cut their visit short. Understand that if your friend is visiting and she's with her kid, she may need to keep getting up to see what her kid is doing. Make an effort to understand her kid's speech or gestures. Make the effort to get to know her kid. Talk to her kid. Ask questions. Take a genuine interest. 5. Reach Out/Check In. If you haven't heard from her - give a call, send a text or email. Chances are, you've been in her thoughts but she hasn't had the time to call. 6. NEVER, under any circumstances utter the words: All kids do that. Maybe this sound like too much to ask of some friends. But did you know Autism Moms have stress similar to combat soldiers. It's easy to be friends during the good times, it's the friends that hang around through the tough times - those are the real friends. And to all my friends - THANK YOU! Thank you for keeping the invites coming. Thank you for calling, emailing, texting. Thank you for your words of support. And thank you for being there for me and for The Boy. Thank you for being a friend!